This year was a year of economic depression for the country. It is difficult to determine how bad things were in Homestead. On the one hand, there was a record-setting number of suicides and arsons and far more charity activity than I’ve ever read about. On the other hand, almost all the industry news was about mills reopening, orders coming in, payrolls increasing. I suspect overall things were a lot worse than the paper let on. 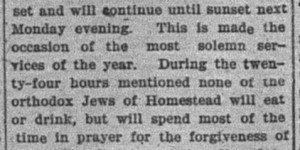 As seems to often be the case during bad times in Homestead, the amount of coverage of the Jewish community plummeted. Nevertheless, there are a few interesting stories that got a lot more sustained coverage than the paper usually managed — see the sections labeled “don’t miss!” below. 1/4: For the 25th anniversary banquet of the Magdala Lodge No. 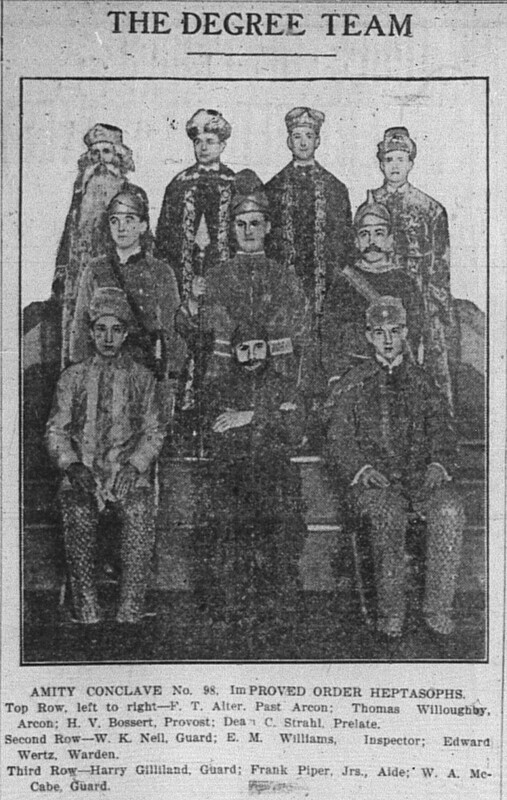 991 of the Odd Fellows, “Chairman Lasdusky, of the press committee, has obtained a handsome souvenir program which will commemorate an important and notable event.” On 1/17 a big front page article about this anniversary included a picture of Lasdusky along with others on the committee of arrangements. 1/15: B. Hepps was re-elected to the board of the Homestead Savings Bank and Trust Company along with I.S. Grossman and Morris Half. 2/12: The local business men’s association was booming. Amongst the new members: Max Gross, Ben Little, Max Glick. Old members reinstated included Joseph Lasdusky. Thought it is nice that they were included, it does seem like Jews were far underrepresented from their actual numbers in the business community. 3/7: Many representatives were named for the Homestead Relief Bureau. Representing the “Hebrew congregation” was Morris Frankel. 3/23: Rabbi Leonard J. Levy of Rodef Shalom in Pittsburgh “has been secured to address the Munhall high school class at the commencement exercises. Rabbi Levy has been heard in Homestead before and it will be good news to all the friends of the school to know what the is to appear at the commencement. The commencement exercises this year will be more than usually interesting. 4/21: Check out the bottom-right baby! 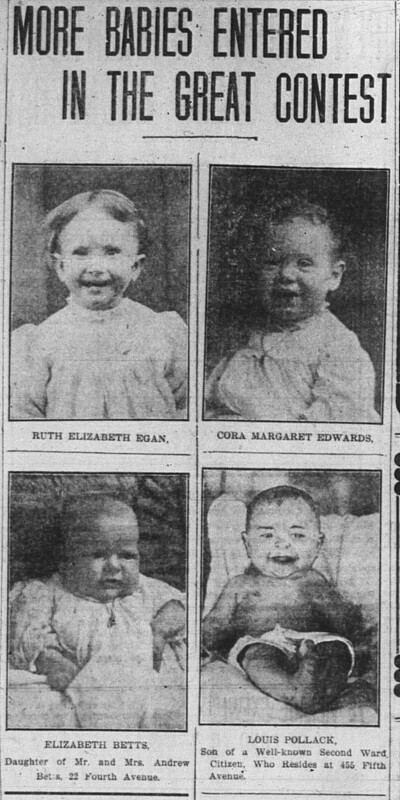 4/21: A cute baby contest started 4/18, and Louis Pollack, son of Harry Pollack, was one of the entrants! See his picture at right. As of 4/30, he was hanging in there — in 10th place with 8,715 votes (first place then had 16,600 votes). Alas, the contest ended 5/19, and he missed the prizes. 5/13: The Businessmen’s association announced the committees for its upcoming picnic. Train no. 1 committee included Lasdusky. Reception committee included Max Schoenfield, Max Glick, Max Gross, I.J. Goldston, Lewis Glick, H.L. Little, Ben Little, and Max Markowitz. April and May were the months of the youth baseball league, and this year there were lots of mentions of teams with members of the Jewish community. There were the Columbia midgets with Eskowitz and Samuels. There were the Teddy Bears, with a rotating group of mostly Jewish players including Jacob Hepps, R. and L. Lasdusky, David Israel, S. Israel, M. Haupt, A. Hepps, M. Moranz, Glick, Pollack, and Eskowitz. They placed repeated announcements like, “The Teddy Bear midgets would like to arrange games with any 9 or 10 year old team. Address Jake Hepps, 406 Dickson street”. That’s my grandfather! 6/23: The hospital board election would take place that evening. Candidates for director included Mrs. Morris Frankel and Mrs. M. Marks (vote for 7 of 13). 6/24: Mrs. Marks made the cut, but not Mrs. Frankel. 6/9: The Daughters of Rebecca had their installation of officers. Mrs. Sallie Lasdusky was installed as Noble Grand. 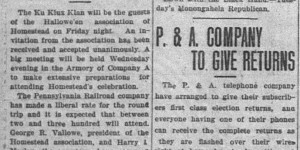 8/1: The town’s relief committee ran out of funds. Amongst the $14 in donations collected at the meeting was $1 from Hepps & Markowitz, the liquor wholesalers. 8/11: For weeks there had been controversy growing against the contractor hired to pave some streets in Homestead. It’s really not worth going into here, except to say that amongst the many plaintiffs were Max Markowitz, Louis Glick, Daniel Saron, Joseph Fried, M.D. Weiss, Henry Glick, Samuel Schwartz, R. Schermer, I. Samuels, I.S. Grossman, Henry Markowitz, and Morris Grinberg. The defendants include the contractors, the burgess, the borough treasurer, and most or all of the borough’s councilmen. Ack! 8/22: Prizes for the upcoming business men’s meet included donations from Half Bros., Jesse Wolk, Little, and Segelman. 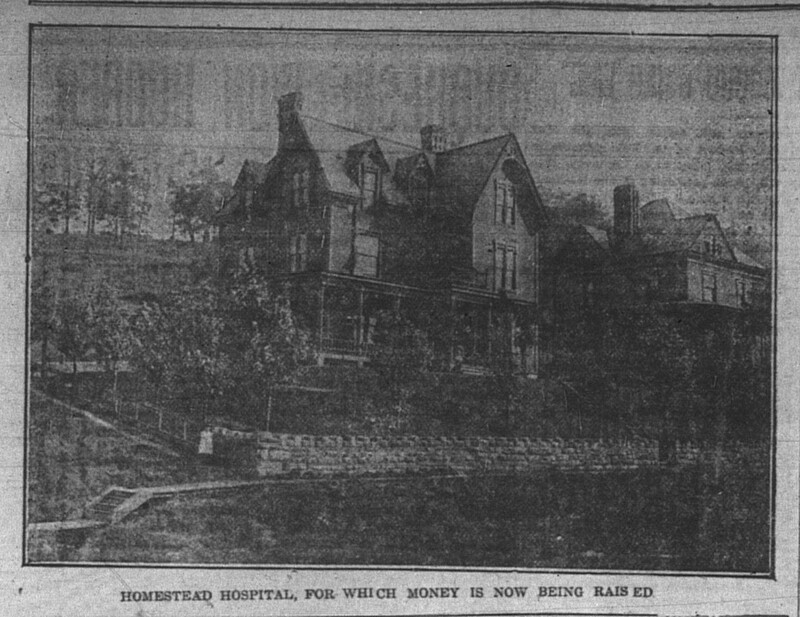 9/14: The first Homestead Hospital. It opened the evening of 12/1/1908. 9/15: On 9/12 the hospital had a “tag day” fundraiser; girls went on the street and placed tags on people who were then expected to donate. $600 was raised, including from Cecelia Marks 11.73, Esther Grossman 6.35, Jennie Friedlander 2.4, Ruth Sobel .85, Ida Goldman .15, Edith Widom .55 (the rabbi’s daughter! ), Mark Fischel 2.85, Mrs. Marks 13.85, Mr. B. Glueck 7.75. 10/15: Homestead hospital’s physicians were elected. They included Dr. Maurice H. Moss. 11/13: Lasdusky a leading citizen of Homestead! 12/2: I. Grossman raised $2 for the hospital by making a man who tried to steal his barrel donate. “This is a good example for other business men to follow.” Article below. 1/18: Lasdusky should be re-elected! 1/27: Lasdusky won his primary, 118-93. 2/19: “In the Second ward there were some heated arguments but no disorder and the result there is about as anticipated, Joseph Lasdusky wining out over Edward McKeown for school director just as he did at the Republican primaries, although McKeown put up a great fight under heavy odds. Lasdusky’s majority was 52.” He wasn’t reported as having taken his oath of office until 6/2?! 3/5: Morris Fogel was listed as a patrolman in the police department. 6/2: Tickets for business mens’ annual outing were available at various places including the store of H.L. Little and Half Bros.
6/10: Lasdusky was named to the “Text books and supplies” committee of the school board. 7/17: Earlier in the month a school started for adult foreigners. 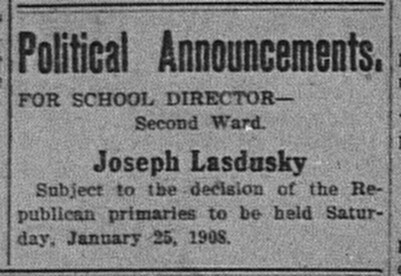 A week later Joseph Lasdusky was one of the men unanimously elected to the local board of managers. 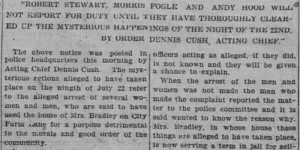 7/24: A notice was posted in police headquarters by the chief: “Robert Stewart, Morris Fogle and Andy Hood will not report for duty until they have thoroughly cleared up the mysterious happenings of the night of the 22nd.” Somehow this was related to the “alleged arrest of several women and men, who are said to have used the home of Mrs. Bradley on City Farm Lane for a purpose detrimental to the morals and good order of the community.” Maybe they let the women go?, the article suggests. 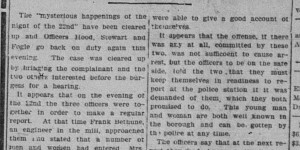 7/25: “The ‘mysterious happenings of the night of the 22nd’ have been cleared up and Officers Hood, Stewart and Fogle go back on duty again this evening.” Apparently they didn’t actually see any “[signs] of disorder” and there wasn’t “sufficient [offense] to cause arrest.” Both articles below, if only for the reason that they are so typical of the haphazard nature of crime and punishment in Homestead at this time. 10/28: The many vice presidents for a Republican rally in Turner Hall included Louis Moskowitz, Joseph Lasdusky, J. Grossman, Dr. M.H. Moss, Harvey Haupt, Max Seigle. 10/8: The Hallowe’en organization got to work. Lasdusky was on the entertainment committee with I. Grossman and others. I wonder what sort of entertainment they’d choose this year? 10/26: The KKK???!!!! 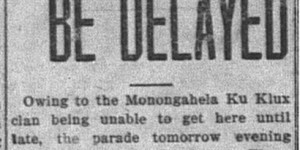 “They will be down in full [from Monongahela] for the big parade next Friday night. They will come on a special train and will have their own band of 40 pieces with them and expect to have between 300 and 400 men in line.” OMG, what??? 10/27: In fact, they were so excited that they decide to have the KKK lead the parade! 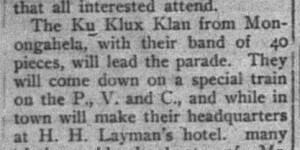 10/29: They were so excited about the Klan that they changed the parade plans for them! 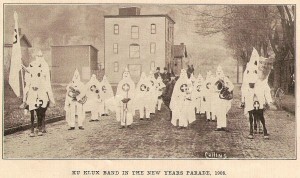 “Owning to the Monongahela Ku Klux clan (sic) being unable to get here until late, the parade tomorrow evening will not move until 8:30.” As a result, they had to be moved to the rear of the parade. Oh, well! 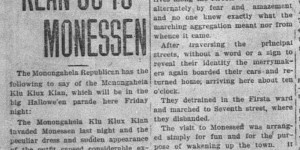 10/29: The Homestead paper reprinted an article from the Monongahela paper about the KKK’s parade invitation. “If sufficient number attend it” (the parade? a welcome reception?) 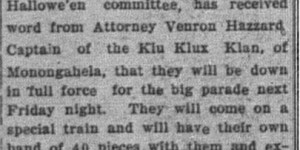 “it is probably that a branch Klan will be established in the steel city. Be on hand Wednesday night [for their preparation meeting] at 7 strokes of the clock OR THEY WILL KILL YOU. Down with the Black Hand.” Caps are theirs. The Black Hand was an extortion racket connected to the Italian mob that was then behind a lot of murders and lesser criminal activity. 10/29: One of the costume judges was Morris Half. 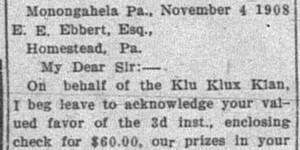 10/30: Prizes came from many merchants, including Half Bros., Schoenfield, Star Novelty (M.I. Grinberg), M. Marks, H.L. Little, J. Wolk, Gross, K. Sobel. 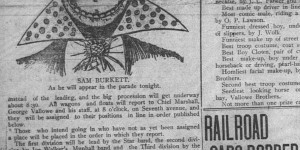 The parade would include floats from various town businessmen, including M.I. 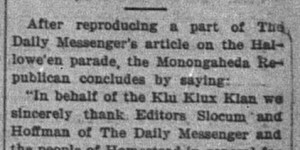 Grinberg and Half Bros.
10/31: “The Klu (sic) Klux Klan from Monongahela made a hit,” adding “a distinctive feature to the parade and gave it that atmosphere which is peculiar to the Hallowee’en season. These men, dressed in all while with flowing robes and pointed hoods arrived in Homestead on the 9:14 o’clock train about 150 in number. They were accompanied by their own band also dressed in the peculiar garb of the organization. 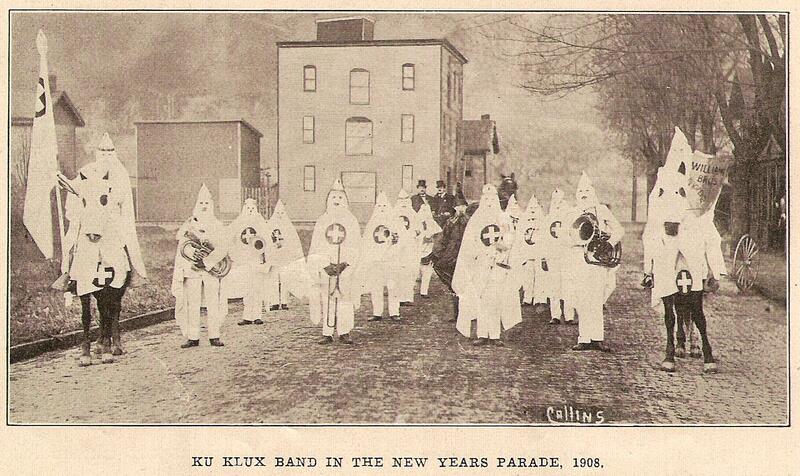 The Klan joined the parade at the corner of Amity street and Ninth avenue. They drilled in an excellent manner along the route and [demonstrated] tactics entirely their own. The people of Homestead were much pleased with this organization and extend much praise for their coming here and their excellent organization.” Overall the crowds were orderly, with the usual mischief by small boys and arrests for minor offenses. There were twenty thousand people on the streets. The noise was deafening with the sound of tin horns, cow bells, whistles, and such. I must add a comment: the most chilling thing about all of this is that not once did any of these articles even obliquely acknowledge what this group is about!!! On both sides they were falling all over each other to profess their mutual appreciation in a way never seen in the paper before or since. And they went on to bigger things, like Pittsburgh’s Sesquicentennial. 1/18: “There has been a change made in the editorial staff of [the high school] department. Chass. Frankel, who has edited this column for the past few months and who has shown considerable ability both as a news gatherer and writer has been forced to resign owing to the pressure of his studies, and the department has been placed in the hands of a staff of five editors.” Ha! Five people?! Well, the column did grow much longer as a result. 2/29: The junior class at the high school threw a party for the seniors. 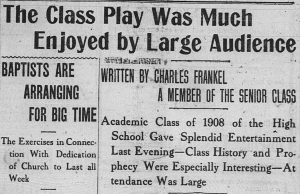 The president of the junior class was Max Weiss, who also played a violin solo. Also in the junior class was Isabel Lebovitz. 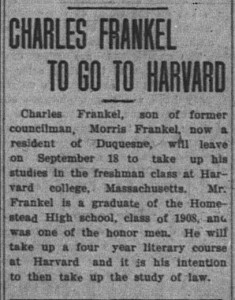 Charles Frankel, a senior, was present. 5/15: The program for the grammar grade commencement included many performance and graduates of interest to us. “Recitation—Poe’s raven in an elevator. Sylvia Ruth Grossman…Recitation—The young ray head. Ross Lucille Weis…Graduates: Second ward – S. Ruth Grossman, Rose Lillian Weiss, Charles Markowitz. Fourth ward – Myers Moranz.” Eighth grade graduation took place on 5/25 in Carnegie Hall. 5/18: The graduating class of Homestead High School heard a sermon by a local reverend. The service was “beautiful and well-rendered” and most definitely religious in content. Ah, the good ole days of separation of church and state! 5/20: The program for the class day exercises for the senior class of the Academic department of the high school was announced. 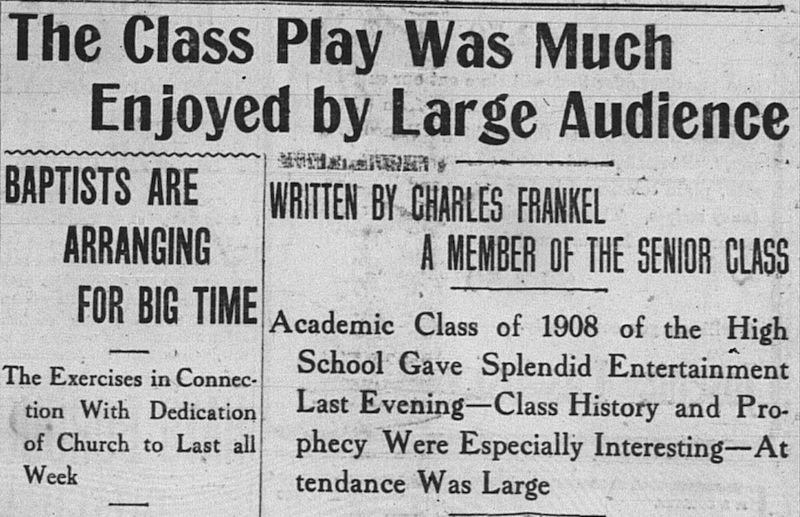 It was to include a play written by Charles Frankel called “‘Tis an Ill Wind That Blows Nobody Good.” He was also responsible for writing the class song to be performed after the play. Can we officially call him an over-achiever yet? 5/23: Frankel‘s play was a hit! to take up his studies in the freshman class at Harvard college, Massachusetts. 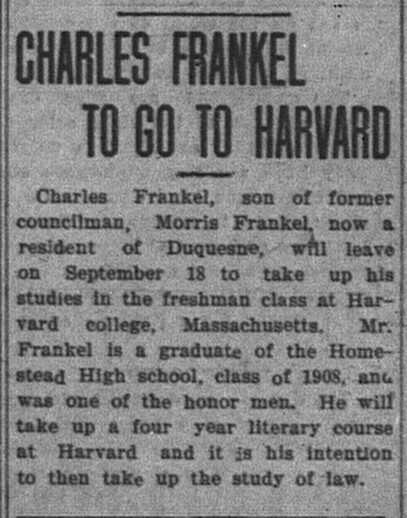 Mr. Frankel is a graduate of the Homestead High school, class of 1908, and was one of the honor men. He will take up a four year literary course at Harvard and it is his intention to then take up the study of law.” As it turned out, six of the seven male graduates of Homestead High ’08 were going to college. Other destinations included Notre Dame, Washington & Jefferson, Allegheny College, Pitt, and Penn. “It is double whether there are many High school classes in the state that can surpass such a record” (9/12). 11/25: From the first ward school room 6, Sarah Valinsky was in a comedy, “The Puritan Maids Prepare for Thanksgiving.” She had the role of Mary Chilton. 12/7: The sophomore second basketball team included Haupt as forward and Wise as guard. This year the complete lists of applicants and grantees were not published. Some of the new applicants included Morris David Weis of 512 Heisel and Martin Silber & Max Greenberger of 490 Seventh Ave. in West Homestead (3/14). The paper reported that Homestead’s retail applicants had “easy sailing” in license court (3/31). The retail results brought a big surprise — Louis Moskowitz was refused. Granted were Bernhard Hepps, 406 Dickson street; Adolph Rosen, 530-532 Heisel street. Refused were Morris David Weis and Silber & Greenberger. 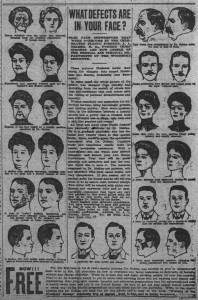 “No increase has been made in the number of licenses…the business depression of the past few months had a telling effect upon the salon keeper and wholesalers, nearly all testifying that their business had fallen off from 25 to 50 per cent… apparent that no new licenses were necessary” (4/21). 2/12: “A bold robbery took place on the upper end of Eighth avenue last night, Morris Grinberg‘s department store being entered sometime during the early morning hours and considerable plunder carried away…the thieves broke open the cash register and found some small change which they carried off along with a lot of valuable articles.” The police believed boys were responsible for it. 2/24: “On Sunday morning shortly after midnight an alarm was turned in because of a small fire in a stable in Cherry alley near McClure street at the rear of Third avenue The building belonged to and was occupied by Isaac Samuels, grocer, and several bales of hay were destroyed. It is said that the firemen on entering the building where the fire was could detect very distinctly the odor of oil.” The article went on to relate that there had been many fires recently, mostly suspected to be arsons. 3/11: There was a bankruptcy sale for Henry Soble, who sold gents’ furnishings at 217 Eighth avenue. 3/31: A. Arkin‘s furniture store on Eighth avenue above McClure failed. 5/12: “The third attempt since last Thursday to rob the store of H. Glick on Ravine street, Munhall, was made this morning, but the robbers were scared away by shots fired by Mr. Glick…Recently the robbers succeeded in getting some things from the store and since that time Mr. Glick, who sleeps in the store, has kept his fire arms well loaded.” This area was a quite impoverished one with many attempted robberies, and all the people in the area were apparently keeping a lookout to curtail the crime. 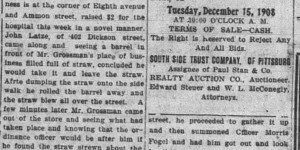 6/13: Ed Hertz was arrest for having a “house of assignation” at 141 Fourth avenue, which roomed an average of a half dozen couples a week. Julius Swartz was his cousin. 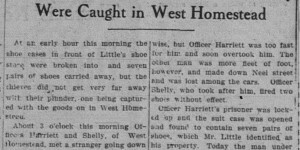 7/9: Early this morning robbers stole 7 pairs of shoes from Little‘s shoe store, but one was caught pretty quickly thereafter, and the next day the police were hot on the trail of the other. Both, it turns out, were implicated in numerous other robberies. Full story below. 11/19: In the category of I-saw-that-coming, there had been growing controversy since the spring about the quality of Homestead’s milk. Various inspectors got involved and the results that came back were poor. On this day it came out of one of the milk men “given an exceedingly low rating” was “Mr. 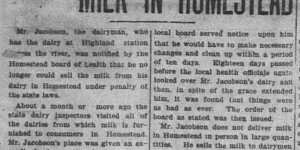 Jacobson, the dairyman, who has the dairy at Highland station across the river…because of its unsanitary condition.” He was forbidden to sell milk in Homestead. Full article below. Sorry to all my new Jacobson friends for uncovering this scandal. 12/28: Oh dear. 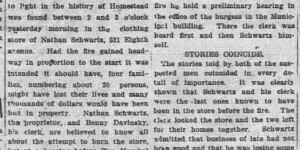 “The most dastardly attempt to burn a building that has even been brought to light in the history of Homestead was found between 2 and 3 o’clock yesterday morning in the clothing store of Nathan Schwartz, 521 Eighth avenue.” He and his clerk, Benny Davinsky, were accused of starting the fire. “Patrolman Fogel…heard someone calling and…found Emanuel Mervis, who lives in the Shields building yelling fire. 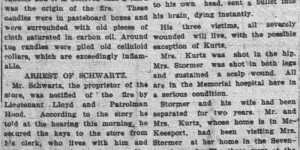 Fogel then turned in an alarm and assisted awaking the other families in the building.” For context, there had such a string of suspicious fires in the fall and winter (typical for Homestead when economic conditions were poor) that even the paper asked for the town’s help to find the “fire bug.” Full story below. 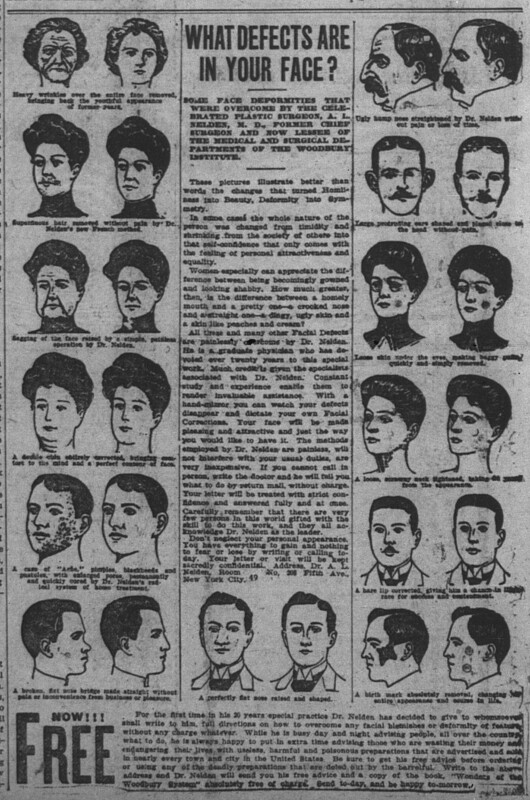 8/22: An ad about correcting facial defects. The top-right image is… not at all problematic, right? 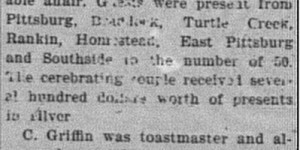 2/22: Yet again the businessmen of Homestead tried to get rid of trading stamps. 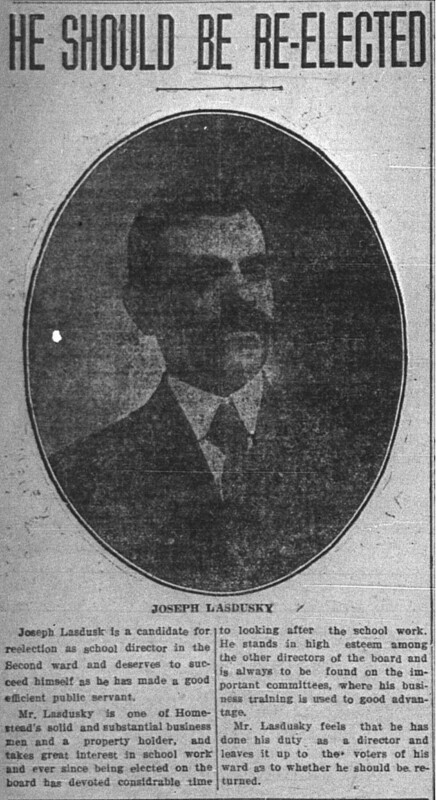 A long article listed the leading merchants on board, including Joseph Lasdusky, H.L. Little & Bro., Nathan Schwartz, Max Gross, L. Trau, Morris Grinberg, B. Friedlander, and Half Bros. on 2/25 The Busy Bee Hive, B. Friedlander’s store, reversed course and decided to keep accepting stamps. 2/28: An ad about merchants who would still accept stamps included merchants less often seen in the paper, including G. Siegal, groceries, 622 City Farm Lane; E.J. Schwartz (sic), dry goods, 313 Dickson Street; D. Magliavy, housefurnishings, 522 Dickson Street; Sam’l Feinholtz, clothing, 303 Dickson Street; and O. Magram, dry goods, 438 Third Avenue. Under the awful economic conditions then-prevailing, the smaller-time merchants needed to hold onto their customers even more than the big guys. 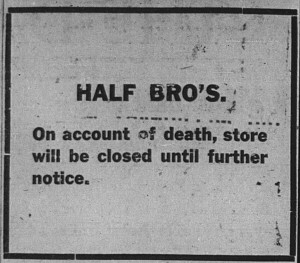 3/27: The Half Bros. and Lasdusky spring openings received much attention in the paper. 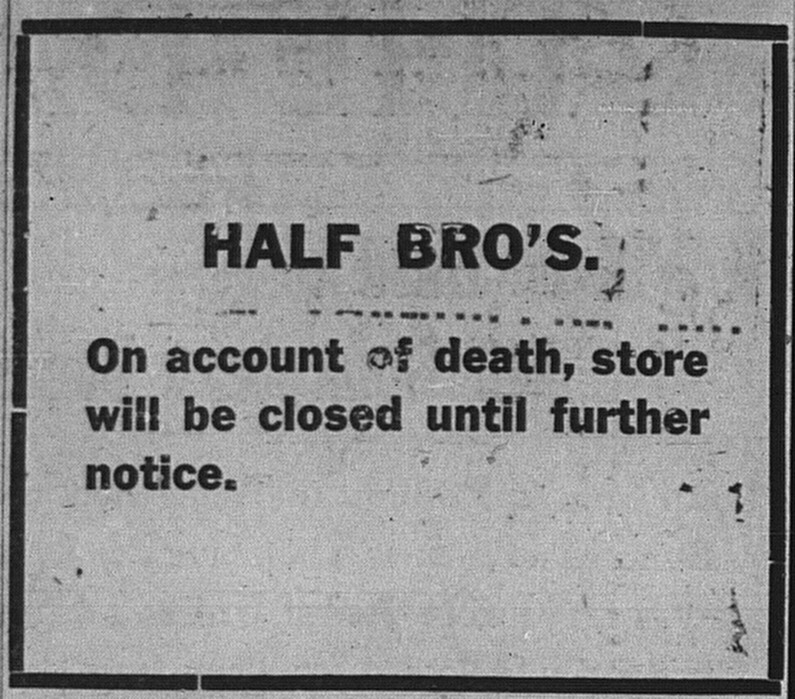 3/27: “Close to 5,000 people passed through Half Bros’ furniture store yesterday on the occasion of their annual opening…’Half Bros. have as fine a store as any in the city,’ was the verdict of all who attended.” “Lasdusky’s store drew great crowds last night, it being one of the most attractive places along Eighth avenue…The window display in this store is one of the prettiest in town, being the work of Mr. Lasdusky himself. 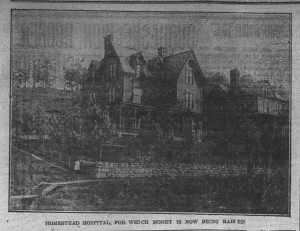 5/9: This article from the Duquesne Observer was reprinted in the Homestead paper. “Morris Frankel has taken up his resident in Duquesne and will make his home in his new block on Linden avenue. Mr. Frankel has been a resident of Homestead for many years and moved here only a few days ago. During his residence in Homestead he attained considerable prominence and served one term in the borough council of that town. He is an enterprising man and last year became interested in Duquesne real estate. He bought property at the corner of Linden and River avenues and erected a large business and residence block. He think Duquesne real estate is a first-class proposition and means to add to his holdings here. Mr. Frankel is a brother of Mrs. Samuel Ferderber, of Camp street.” Was it a good idea for Frankel to leave Homestead? W On 8/1 the Homestead paper reported that the Duquesne paper “[claimed they have felt little of the hard times.” Apparently there were “more men employed in Duquesne in the first 6 months of this year than any other period except 1906.” Related, possibly, was the dedication of Duquesne’s first synagogue building on 9/6/1908. 5/29: A big sale was on at Grinberg’s Big Department Store. 9/14: The Half Bros. fall opening got a large write up in the paper. 9/24: The “best millinery openings are taking place,” including Lasdusky‘s. 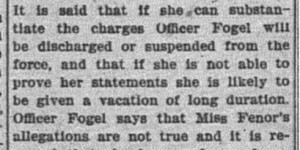 9/30: Morris Fogel arrested a sort of notorious local celebrity when he hit his wife for waking him up to discuss the imminent celebration of Pittsburgh’s sesquicentennial. 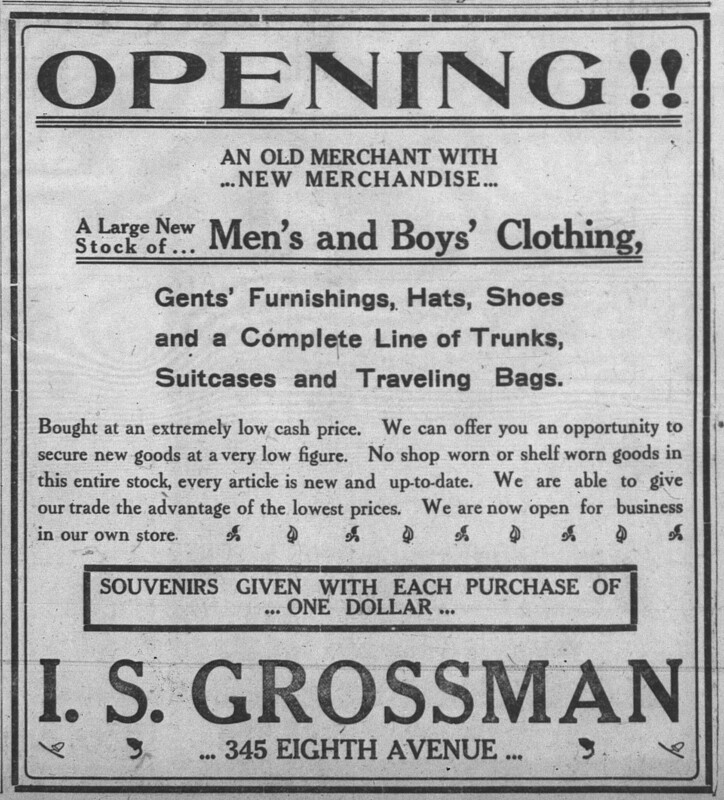 10/23: “The five Wolk brother have opened a big department store” in Pittsburgh. 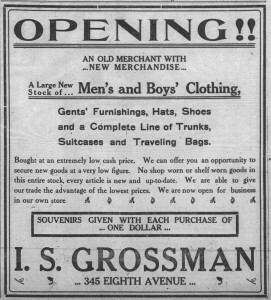 “The Wolk brothers are all well known here, all having at one time been in business in Homestead, Jesse Wolk, one of the firm, still being in the shoe business here…Sol Wolk, who was in the shoe business here for a number of years, will have general supervision over the store.” Apparently each had been in a different line of business and now they were “[pooling] their interest.” Article below, as it sheds light on one way families supported each other in business. 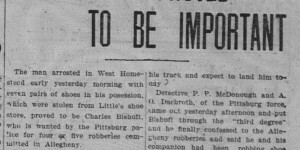 3/5: “Solomon Arrested As Incendiary,” blared the all-caps headline related to the fire in a large barn in McKeesport. Julius Solomon “has been a resident of Homestead for a long time. He has been a naturalized citizen of the United States for about seven years” (how is this even relevant?) “and he claims that he is innocent of the charge upon which he was arrested. He states that when he appeared before the justice in McKeesport and explained who he was the justice said he could go, but this he refused to do. He employed attorneys last evening and will as he says, ‘Go after that constable’s neck.’ It is intimated by the local police that Solomon is not so innocent of the origin of a number of fire as it might seem, but there is no evidence against him.” 3/6: New day, new headline, but smaller than the first: “Solomon is the wrong man.” Whoops. 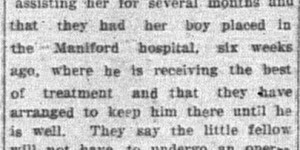 4/25: “The remains of the man who committed suicide in the Hotel Wendt in West Homestead yesterday are still unidentified. The Hebrews of Pittsburgh will bury him.” 4/28: “The body of the man who committed suicide on Thursday afternoon of last week by drinking carbolic acid in the Hotel Windt, Eighth avenue, West Homestead, was identified yesterday at the morgue by Peter Lesischatz of Rowley street as Maurice Echsler, a printer.” (The death certificate had the names as Peter Lifschitz and Morris Wechsler. He was about 28 years of age from Russia. He was probably buried in the Beth Abraham Cemetery (called Whitehall on the death certificate).) Although we will never know what drove him to such despair, others suicides were reported due to lack of work (6/2, 7/20). In July “authorities were alarmed at the number of suicides. All records were broken” that month and in September as well (10/2). 6/24: “There were two exciting runaways last evening…The second runaway occurred on Dickson street between 9 and 10 o’clock. 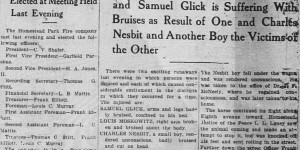 Samuel Glick and Louis Moskowitz were driving when the shaft on the buggy broke. The piece fell against the horse’s leg and frightened the animal so that is started to run away and the driver was unable to stop it…The two men were thrown out and both were bruised, Moskowitz suffering a broken arm. Their injuries were attended to by Dr. M.H. Moss.” Full article below. 4/14: “Paul Friedlander, of Wheeling, W. Va., is visting his brother, J. Friedlander, of Eighth avenue.” Passover! 6/4: “Paul Friedlander, of Wheeling, W. Va., is spending a few days with his brother, Benjamin, of Eighth avenue.” Shavuot! 2/24: “Mr. and Mrs. Isaac Hertz, of 153 East Fifth avenue, yesterday celebrated their twenty-fifth or silver wedding anniversary. A large number of the friends of the celebrating couple gathered in their home and a pleasant time was spent. Mr. and Mrs. Hertz received many congratulations from their friends as well as many handsome gifts.” The following day the party received a much more detailed write-up about the entertainment Miss Rose Hertz and other guests provided; read it below. 2/27: “Mr. and Mrs. Lasdusky were completely taken by storm by their friends in their home, 528 Ammon street, on three occassions this week.” Read the article below to see how the Ladies’ auxiliary of the synagogue, the Arabella Rebekah lodge, and the Magdala encampment of Odd Fellows marked their fifteenth wedding anniversary. 6/5: “Dr. Phil Cohen of Duquesne, is in Homestead today receiving the congratulations of his friends, he having just graduated from the Baltimore medical college as a M.D.” Surely they meant Dr. Charles Cohn, son of Philip Cohn. 7/30: “The family of Phillip Cohen, formerly of this place, but now of Duquesne, were strictly in it at the Duquesne Business Men’s picnic at Kennywood park yesterday. Julius Cohen won three races and secured a gold watch, a medal and a water bucket, while Baby Cohen won first prize in the baby show. Both were born in Homestead, which accounts for their being prize winners.” Man, this family is getting more coverage after leaving Homestead than they did while there! 9/19: A surprise party for Charles Frankel on the eve of his departure for Harvard! Guests came from Duquesne, Pittsburgh, McKeesport, Homestead, and Braddock. Only one Homestead guest was named, Isabelle Leboorts (Lebowitz?). One Duquesne guest with a Homestead connection was Mrs. Hetty Skirboll. Judging by names, all the guests were Jewish, and none were his high school classmates. Full article below. 8/8/08: Fogel in trouble again! 1/14: More inclusions of meetings of the Ladies’ Auxiliary of Rodef Sholem in the “club room” on Ammon street (wonder if this is the synagogue basement or somewhere else?). 3/18: “The Ladies’ Auxiliary of Rodof Sholem will hold a masquerade party in Casino hall this evening which promises to be one of the most pleasant social events held by the Hebrew ladies this winter. There will be three prizes for ladies and three for gentlemen. Ice cream and cake will be served in a dainty manner and there will be other features to make it pleasant for those present. The affair will be strict an invitation and only those with invitations will be admitted. Mrs. M.H. Moss is the president and Mrs. N.J. Feldman, the secretary.” Interestingly, that evening there was also a highly promoted charity minstrel show to support the town’s poor (as a result of the economic depression). 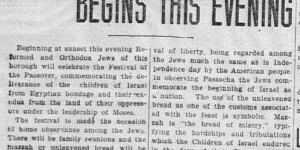 4/15: “Beginning at sunset this evening Reformed and Orthodox Jews of this borough will celebrate the Festival of the Passover.” Like many Passover columns, it’s almost-but-not-quite there in its descriptions of Passacha, mazzah, and its “[commemoration] of the resurrection of nature” which “resembles the Christian festival of Easter.” Full article below. 6/24: The Ladies Auxiliary of Rodef Sholem held a meeting last evening at which officers were elected for the ensuing term. The meeting was well attended. The officers elected are as follows: President, Mrs. M.H. Moss; vice president, Mrs. M.D. Wiess; secretary, Mrs. N.J. Feldman; treasurer, Mrs. Meyer Grinberg. 7/1: The Ladies Auxiliary of Rodef Sholem are today holding a picnic at Homestead park. This is the second annual picnic of this organization. Games during the afternoon and dacing this evening are the features of the outing. 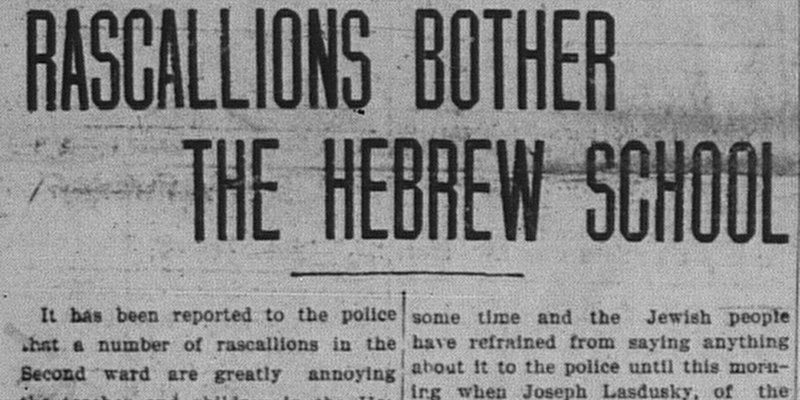 7/23: “Rascallions Bother the Hebrew School,” reads one of the best headlines to ever appear in the Homestead newspaper ever. Apparently they yelled in the windows, taunted the teacher and children, threw stones, and bothered kids going to and from school. “This thing has been going on for some time and the Jewish people have refrained from saying anything about it to the police until the morning when Joseph Lasdusky of the school board, asked that the police keep a lookout and give the school some better protection.” Full article below — worth a read, as it provides rare insight into what the day-to-day life of a Jewish child at that time might have been like. 9/25: “The Hebrews will begin at 6 o’clock to celebrate their New Year. New Year with the Jews is a day of worship and all those of that faith will close their places of business from 6 p.m. tonight until 6 p.m. tomorrow evening and spend the greater part of the time in the synagogue.” And the article concludes with some of the same calendar talk from before. 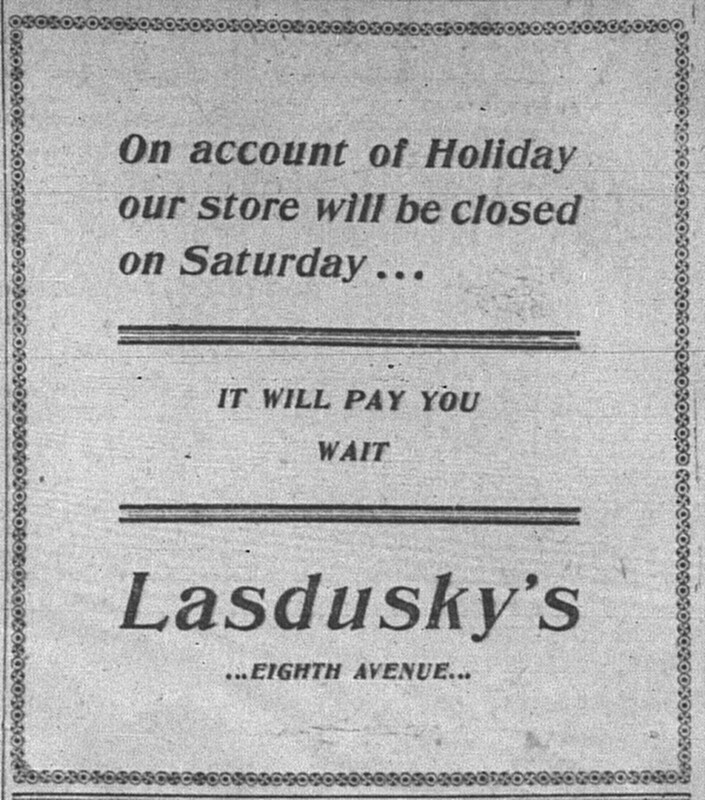 Unfortunately the millinery openings were on Thursday, 9/24, meaning that merchants like Lasdusky would miss out on a good deal of business. 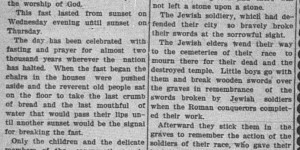 9/26: A much longer article that is off by a day wrote “the sonorous sounds of the ramshorn will be heard tomorrow and Monday in the Hebrew synagogue, on Ammon street, in memory of one of the interesting Jewish holidays.” Read it below. 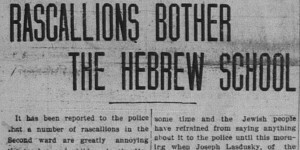 10/3: “Hebrews to Have Another Holiday Monday,” begins a longish article about Yom Kippur. See below. 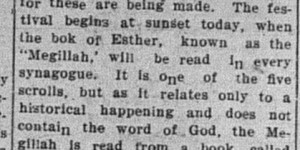 10/14: It isn’t often that the paper mentions Sukkot, but this year they did. “The nine-day celebration of the feast of the Succoth was begin Tuesday by the Jews of Greater Pittsburg. On the first and the last two days of the feast no work is allowed to be done except the preparation of food. During the nine days service will held in the synagogue on Ammon street by the local Hebrews.” Although properly the stores ought to have been closed, I suspect they were not. 10/14: “The Ladies auxiliary of Rodef Sholem of Homestead will hold its third annual ball in Casino hall on Tuesday evening, October 27. It is expected that this event will be largely represented. Social events conducted in the past by this organization have always proven to be successful and enjoyable ones and this coming ball will eclipse all previous ones. The committee of arrangements is composed of Mrs. N.D. Weiss, chairman, Mrs. M. Fischel, Mrs. N.J. Feldman, Mrs. B. Friedlander, Mrs. Morris Frankel and Mrs. H. Aarons. The officers of the auxiliary are Mrs. M. H. Moss, president; Mrs. M.D. Weiss, vice president; Mrs. N.J. Feldman, secretary, and Mrs. M.I. Grinberg, treasurer. 10/27: “Mrs. B. Friedlander, of 518 Eighth avenue, was tendered a surprise party Sunday by the Ladies Aid society of the Rodef Sholem Hebrew congregation. The ladies gathered in large numbers and went to the Friedlaner home and took Mrs. Friedlander completely by surprise. Several pleasant hours were spent in social pass time and speech making and all had a good time. A nice lunch was served.” Why??? 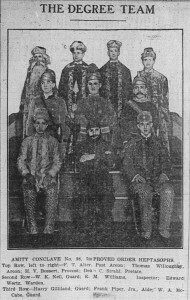 10/27: “This evening the Ladies’ auxiliary of Rodef Sholem will hold a ball in Casino hall, which will be largely attended is present indications count for anything. This ball will be one of the most important social events of the season by this organization this season and a pleasant time will be had.” Then the committee and officers are copied from the previous article, but with many more typos. 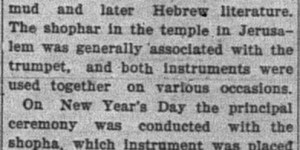 12/22: A longish article, included below, describes the Chanukah celebrations led by the pupils of the Hebrew Sunday school and day school. 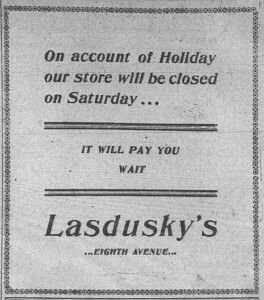 Lasdusky was toast master, and “Charles Frankel, who is now a student at Harvard college, made an address upon the life of the Jewish students at that great institution of learning…they commingled socially and were received cordially by all of the Christian students.” Also my great-grandfather B. Hepps, president of the congregation, “explained the derivation and the use of the word ‘Sheeney,’ as applied by Christians to the Jews. He explained that it came from an old word meaning ‘second.’ That the Christians regarded the Jews as being second and that thus they corrupted the word into its present usage as a slang term. 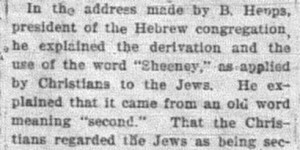 He expressed an opinion that the nickname of the Jew would soon be changed to a word meaning first or equal.” While’s wonderful to see how my love of languages traces to my great-grandfather, this clever faux-etymology from the Hebrew word “sheni” is unlikely! 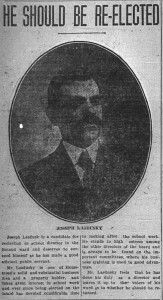 The rest of the program included Joseph Lasdusky, Rev. Widom, Mr. Chermoff (superintendent of the school), Hazel Numerofsky, Mrs. I. Grossman (superintendent), Charles Mervis, Jacob Hepps, David Israel, Samuel Israel, and M.D. Weiss. Refreshments served by M.D. Weiss, Mrs. M. Fishel, and N. Iskowitz. An extremely rare example of an argument internal to the Jewish community spilling over into the press. 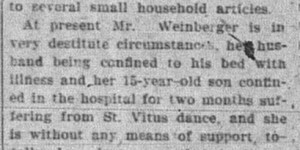 I learned from other sources that the husband in question was in his mid-thirties, suffered from tuberculosis, and passed away in August 1909 of heart disease, so he probably really was sick at the time the community was fighting over how to help his wife, fifteen year-old son, and eight year-old daughter. The family had been in the U.S. only for a few years. There were often notices in the paper about alleged poor people who needed assistance; there was always a step to ensure they were “worthy” poor — i.e. the husband was not lazy, drunk, &c. This incident is the only time the coverage concerned a member of the Jewish community; I suspect it was generally true that the Jewish community handled its cases amongst themselves. 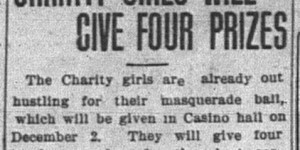 11/4: The “Charity Girls” — Jennie Samuels, Irene Hertz, Etta Hertz, Ray Valin and Rose Hertz — “have arranged to give a select Masquerade part in Casino hall on Wednesday evening, Dec. 2. The affair is for the benefit of Mrs. Josephine Wein (sic), a widow lady, who has a child that is ill and must undergo an operation.” An article on 11/5 details the prizes for costumes. 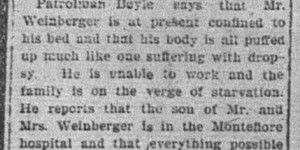 11/21: Now the police got involved, confirming that Mr. Weinberger cannot work, the son is in the hospital, and the house is filthy and has no food. 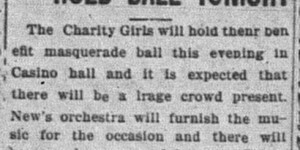 12/2: A brief notice was printed that the Charity Girls’ ball was that evening. 1/18: The new Irene Kaufmann memorial organ was dedicated the previous morning in the new Rodeph Shalom Temple in Pittsburgh. 1/25: Everyone’s favorite converted evangelist, Maurice Ruben, was to tell the story of his conversion at a local church the coming Sabbath evening. Apparently his wife converted and is now helping him with his work?! 4/18: Kennywood Park opened for the season and announced the picnics that had been booked so far. The July schedule included the Hebrew Ladies Aid Society of Duquesne. 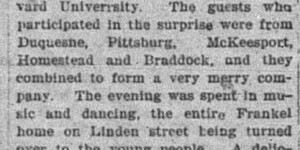 9/14: For some reason two articles were published on the same day about the previous day’s dedication of the Svard congregation in Seventh avenue, McKeesport. 10/6: Rev. Dr. J. Leonard Levy was scheduled to speak at the the Pennsylvania Esperanto Association’s first annual convention later that month. 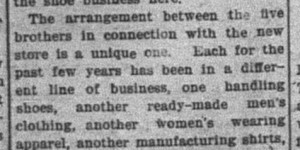 11/5: A long article about the National Council of Women’s 17th annual executive meeting in Union City, Indiana and the participation of Mrs. Hugo Rosenberg, who would attend to represent the Council of Jewish Women and read a paper on the “Jewish View of Social Purity.” The NCJW was one of 17 national and nine local councils affiliated with the NCW. Who knew? 11/12: Rodeph Shalom of Pittsburgh organized what we’d call today an interdenominational Thanksgiving service. “The Rev. Dr. J. Leonard Levy, the rabbi of the temple, invited other clergymen to take part, and at a meeting Tuesday several consented to do so. It was resolved to hold a similar service each year on Thanksgiving afternoon in one of the church of the participating clergymen. This year’s program will be copied in future years. The service is open to all Pittsburghers.” Other tha Levy the clergymen represented many different Christian denominations.